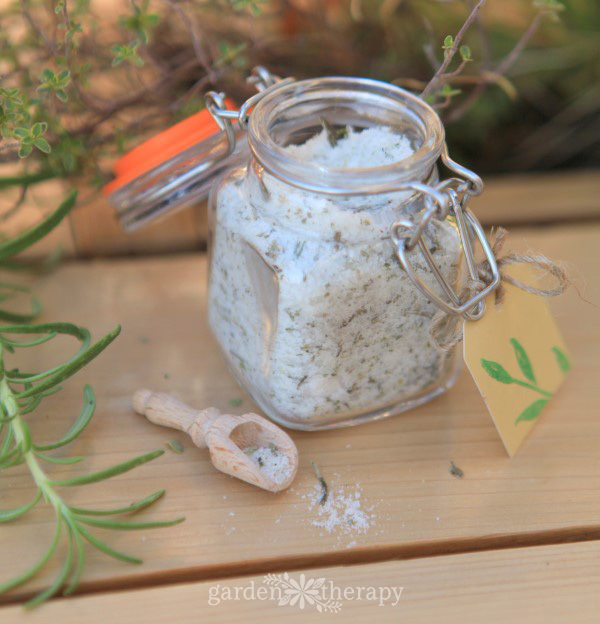 An herbal finishing salt is a flavorful condiment and a creative way to preserve the freshness of the herb garden for use throughout the year. 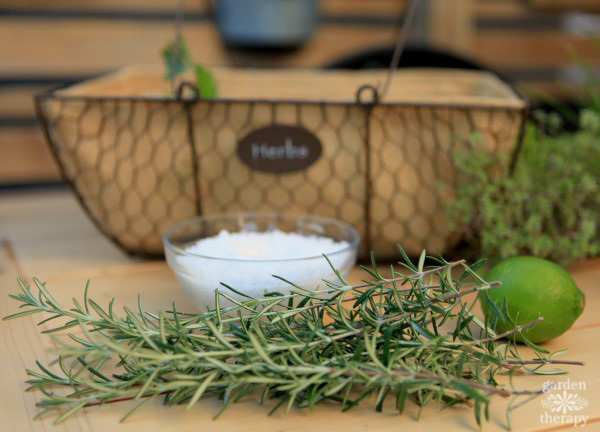 Herb finishing salt can be used to flavor fresh vegetables from the garden or garnish your other culinary creations. 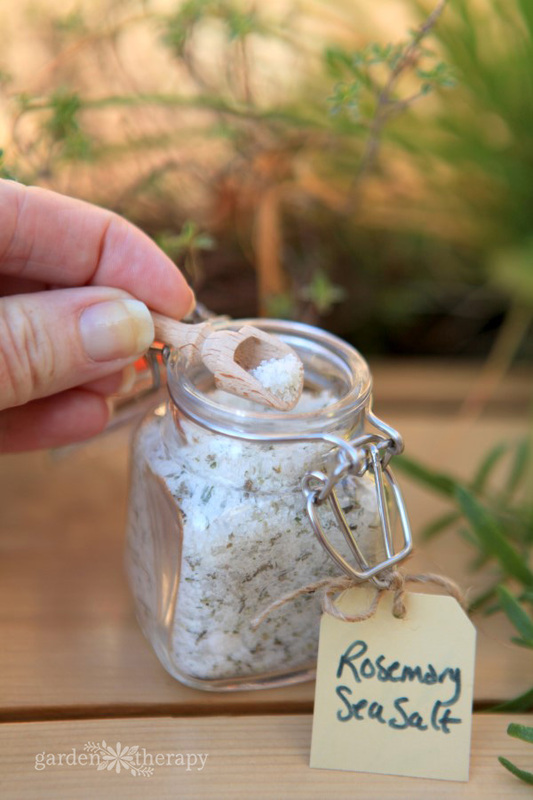 It is easy to make and packed with aromatherapy, making the preparation process a therapeutic journey in itself. I have had a garden loaded with herbs this year! I renovated my kitchen garden last year and it has taken off like a rocket. 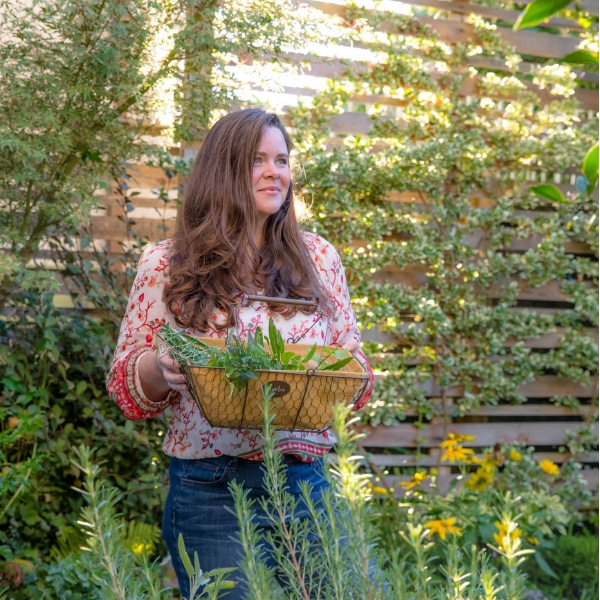 I have giant rosemary, sage, oregano, and mint plants that refuse to be contained, a wine box herb garden, and I even planted some pretty little herbs in my table as you can see in this Deck Makeover project. I’m harvesting, preparing, and giving away a LOT of herbs to the point where my neighbors are locking their doors and closing the blinds when they see me coming with an armful of greenery! They don’t seem to mind herb deliveries all that much. How could they? Fresh herbs smell fabulous and have such a large effect on health and well-being. 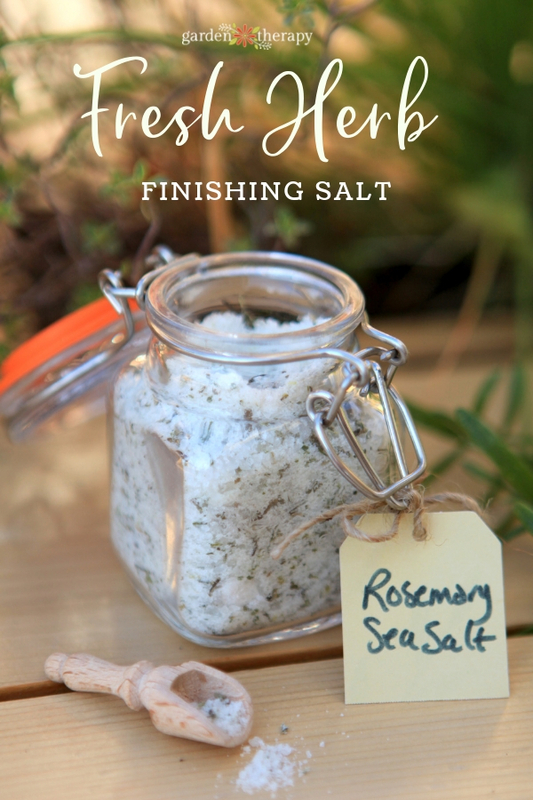 And with so many herbs growing in the garden, a finishing salt is a great way to preserve their flavor and bring it to meals throughout the year. 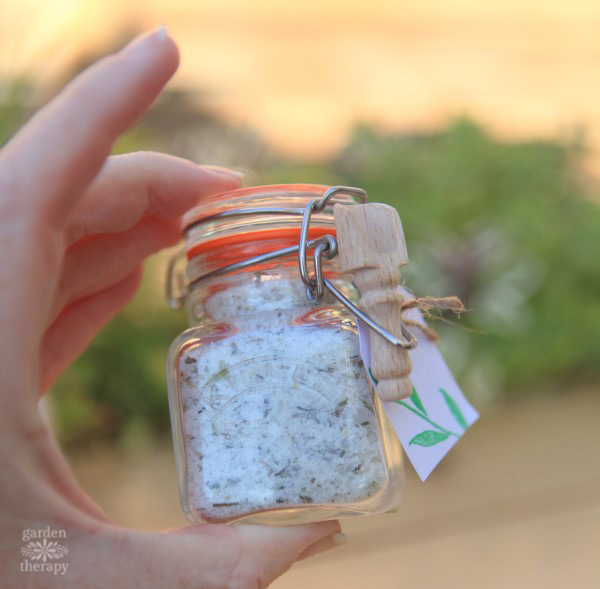 I made these little jars of rosemary lime herb finishing salt for the Burpee Home Gardens dinner event that I hosted a few weeks ago. Thankfully, I had a ton of fresh rosemary because I had to make 25 jars of herb salt. I’ve pared the recipe down to 10 jars to make it a bit more manageable here, but you can scale it up or down depending on how many jars you want to make in the end. 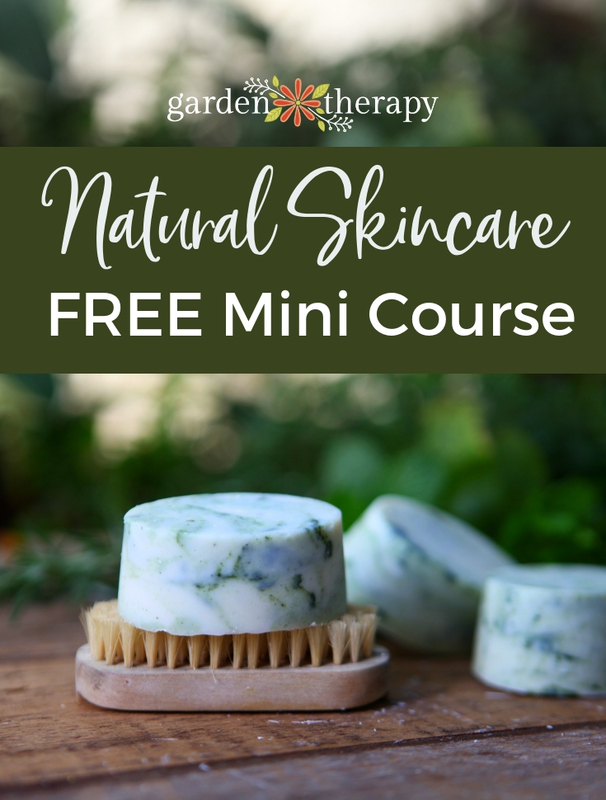 Harvest fresh herbs from the garden and use them for this recipe within a week. 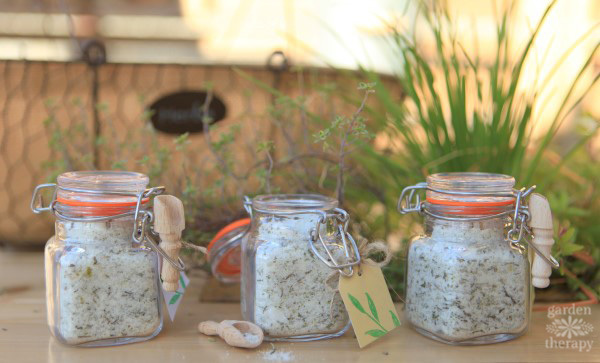 Dried herbs don’t have the essential oils and aroma that make this salt something special. Remove the leaves from the stems of rosemary. The stems are too woody; you just want the tender green leaves for this recipe. 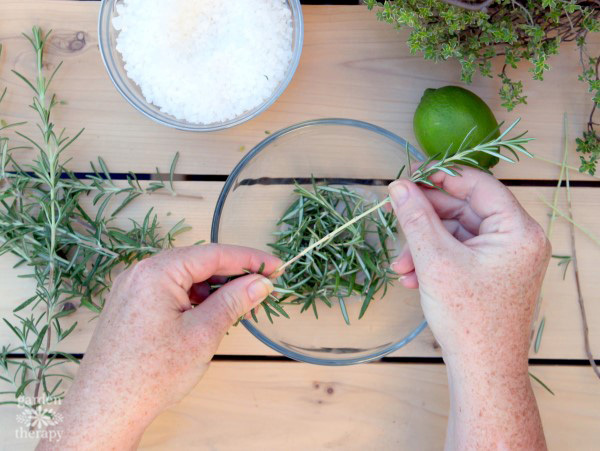 To remove the leaves, pinch the stem at the top with your fingers and hold the top of the sprig of rosemary with your other hand. Pull down on the branch to remove the leaves. 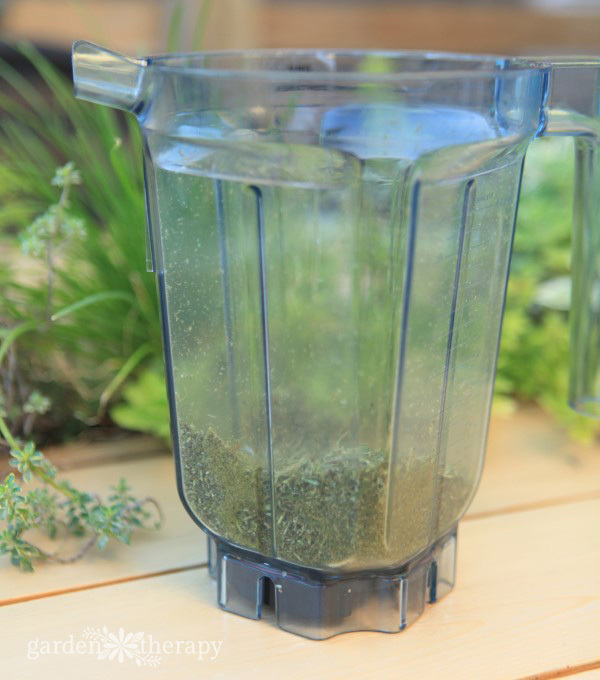 Add the leaves to a powerful food processor or Vitamix blender, or hand cut the herbs finely. I used the dry attachment of my Vitamix and it made quick work of chopping up the rosemary leaves. I went from almost a full blender of leaves to about two cups of chopped-up leaves in seconds. Add the coarse salt to the blender/food processor and pulse to grind up the salt to your desired texture. I like to have a few larger grains of salt in the mix, but at least 80% of it is fine. Mix the leaves with the salt in a large bowl. Add the zest of four limes and stir. Leave the salt, lime, and rosemary to infuse for another week before packaging up in small terrine-lidded jars. Serve herb finishing salt with a tiny wooden pinch spoon because a) it’s cute and b) it keeps fingers out of the salt. Update: I bought the adorable 1″ wood scoops for $2 each at The Soap Dispensary in Vancouver, BC. They don’t sell online yet but according to the website they have an online shop coming soon. I’ve been looking for an online source of these little scoops but the smallest I can find is these 3″ wood scoops. If I find an online source for the smaller ones, I’ll be sure to post it here. Use a dash of finishing salt on meat and fresh vegetables from the garden to add a little bit of extra freshness and garden flavor to every meal. Sun Tea: Two Ways, Hundreds of Possibilities! Hi Sue, It will be good for at least 6 months. The salt acts as a preservative. The herbs perform like dried herbs do – they seem to fade somewhat at the 6-month mark. Which is good timing as the herb garden should be grown in again by then! Great idea for this xmas gift giving. I have an abundance of Thyme. Any thoughts on using that in a similar way? How about thyme and lemon together? Lovely idea! How did you prepare the lime zest? Was it freshly grated, partly dried, or completely dry? I’m curious as fresh zest can be quite wet. Thanks. Hi Katherine, I zested a fresh lime directly into the salt mixture and stirred it in. I hope that helps! I want to make this as gifts. I have two questions 1) when you say you leave the mixture out to infuse for a week, do you leave it in the open air or in a larger sealed container? 2) Can I use this same recipe and substitute oregano or sage? would I still use the lime zest? Thanks! Hi Akeba, I left it open so the lime zest would dry out. And yes, if you like those herbs I would use them. Perhaps rosemary, sage and oregano together and skip the lime? HI hello! 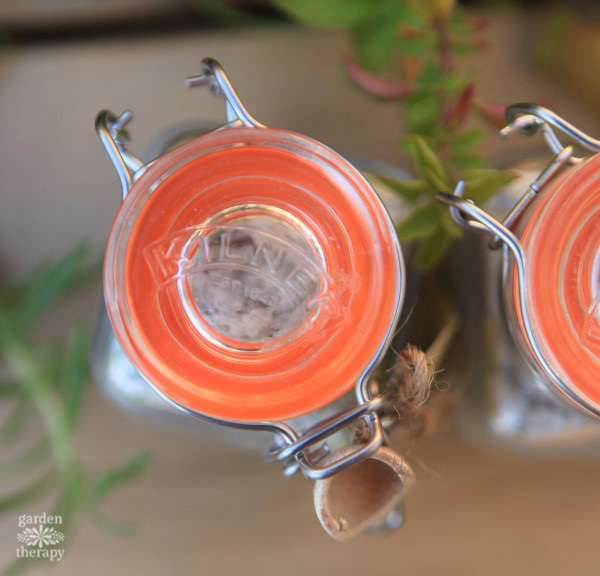 I was wondering where you got your cute jars for your herb salt from. Im doing a small project at my school to help with our ACE foundation. Hi Karin, the jar is a Kilner jar that I found locally. These spice jars should be similar https://amzn.to/2QCMHUR. Have fun!